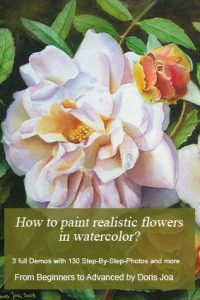 You are a beginner artist and want to start with watercolors? But you don’t know where to start and which tools are neccessary for creating a painting? Many beginner watercolor artists are facing these questions. They want to watercolor and don’t know where to start and which tools are needed. Before we even add a brush stroke to our paper we need some neccessary and helpful watercolor tools to make our watercolor journey a great experience. I won’t tell you what is all available in the art stores. 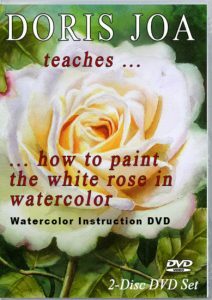 It can confuse you, so I will tell you what I use for my watercolor paintings. 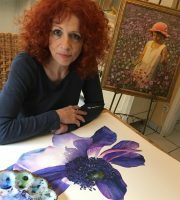 I am a professional watercolorist for many years now and I paint from small up to very large paintings. To work with watercolors you will need watercolor paper. It is not possible to work on other paper. You get watercolor paper at any art store. It is available as blocks, in large sheets or on a roll. And also in different weights. 90 Lb, 140 Lb or 300 Lb. You also will find special boards or canvas for watercolors, too. Avoid student paper or light weight paper. Watercolor papers are available as hot pressed, cold pressed or rough paper. Often art stores offer a set of different papers so you can try out which works for you and which you like the most. My favorite papers are the 140 Lb or 300 Lb hot pressed or cold pressed paper. 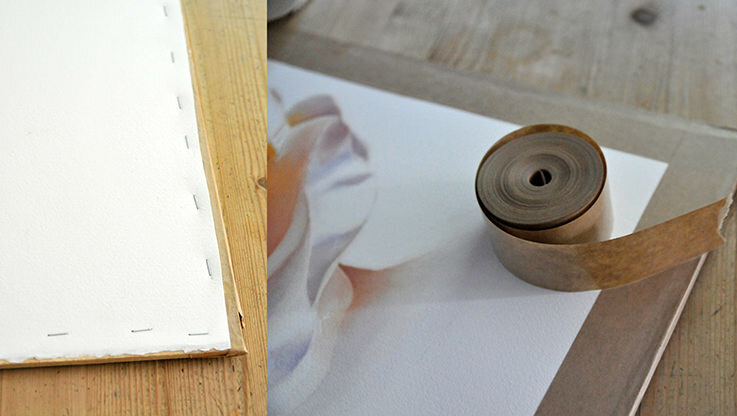 The 140 Lb paper allows me to make my own watercolor canvas. Using the heavier paper (300 Lb) allows me to work on it without stretching. 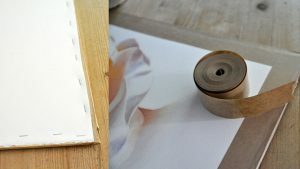 On my art materials page I also share some more knowledge about the different types of paper. Depending on the weight of the paper you will need a board on which you can stretch your watercolor paper. I am using simple wood boards. Once I have wet the paper in the bath tube or in the shower I then put it on the board and use some tape to attach it there. If tape doesn’t work for you then staple it. 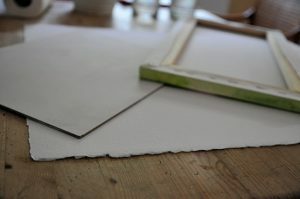 If you wouldn’t stretch your paper it then would buckle once you would paint on it and it is nearly impossible to create then a good painting. Paper which has a weight of 300 Lb doesn’t need to be stretched. Paper which is lighter than that needs to be stretched. When you stretch your paper you then can use some tape to fix the watercolor paper on the board. Unfortunately it doesn’t always work. A good alternative is then to simply staple it. This works always. If you want to create your own watercolor canvas then have a look at my video and learn how to do this. This method allows you to hang your paintings without frame on your wall or if you want to frame it then you don’t need glass. A great method! For painting with watercolors you need also specific watercolor brushes. There are brushes with natural hair available and synthetic brushes. My favorites are the natural hair brushes. They held very well the water and have a very good point and last for a very long time. They cost more than synthetic brushes but it is worth to spend a few Dollars/Euros more. It is not adviced to start watercoloring with bad supplies. Very important is that your brushes do have a very good point. Even when you use a large brush and when it has a good point then you are able to paint the tiny details in your painting. Note: I clean my brushes always with only clean water. Make the right decision about the size. There are many sizes available – from super tiny sizes to very large sizes. It is not needed to have each size. If you want to cover large areas with water and paint then a large brush is very helpful. It works perfect if you have a small size, like a No. 2 or No. 3 and a medium brush in No. 8. I always have a No. 8 brush in use. It allows me to do larger washes in specific areas but it also has a fantastic point so that I also can paint details. But I also have a No. 2 or No. 3 brush for smaller areas. Although I can paint with my larger brush in small areas it is often much easier to use a small brush in small areas. I am using round brushes and a big flat brush for very large areas. Over the years I added here and there some more sizes, but I don’t need them all. 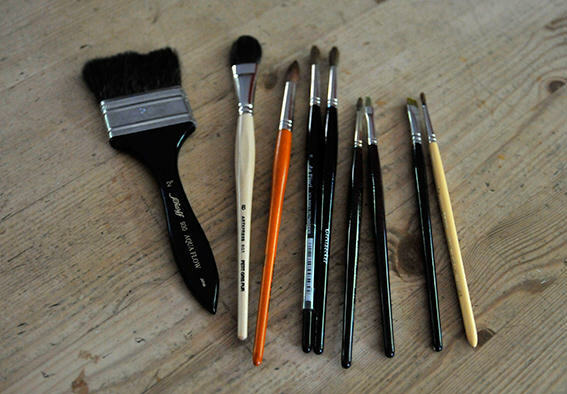 Usually two brushes, one in small and one in medium size, are enough to create a painting. It is not needed to use an extra brushholder. 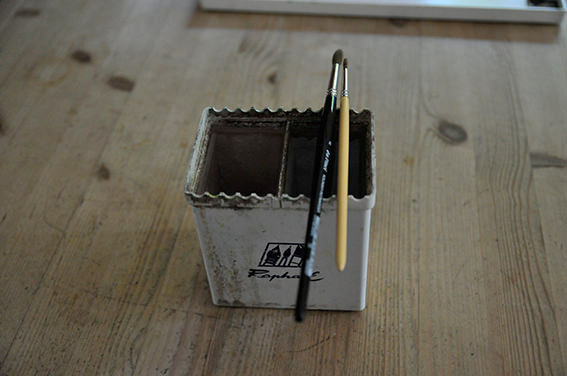 If you buy a water container at an art store then you can get one which is extra created for holding your brushes. Do never leave your brushes in the water. I always have my brushes flat laying beside my painting on some towel. The brushes are too expensive and leaving them in the water would ruin them. 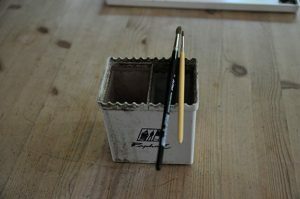 A good alternative is using such a water container which offers the possibility to hold your brushes, too. There are basic sets for beginners available in stores. But you can buy of course each paint individually. 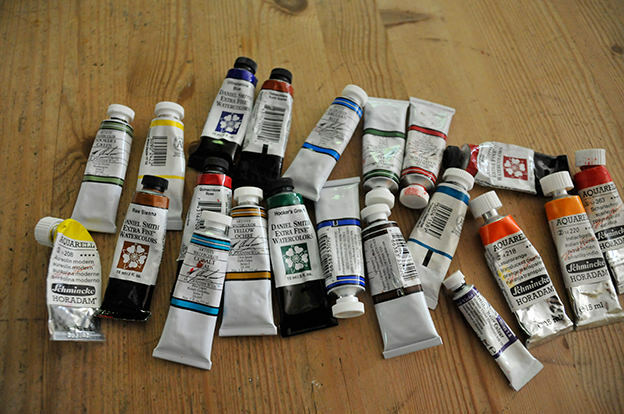 Learn more about the colours I am using for my own watercolor paintings. 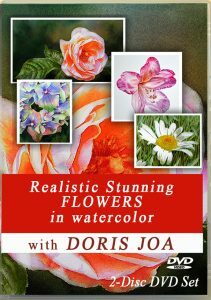 With my palette of watercolours you can paint each subject so you can immediately start to paint whatever you want. But of course I encourage you to try out other colours to figure out what you personally like best. Watercolor Paints are also available as Student’s or Artist’s Colours. I would not use Student’s colours as the quality is not so good as Artist’s colours. 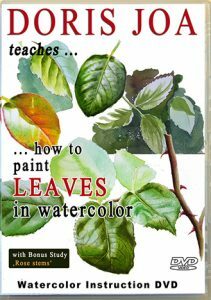 To paint with watercolors is difficult enough – so it is always recommended to use the best material which is available. If you struggle with your paintings then you know for sure that it isn’t the lack of quality in your art materials. Your paints (also those out of the tube) will dry with time. Moisten them with some water and you can use them again and again no matter when your last painting session was. Important to know is that your paints dry always lighter on your paper (or other surface). Wet watercolors always look darker than it really is. This also means that you need to work with more layers of colour if you want to create a rich-coloured painting. You can mix your paints on your palette but you also can let your colours mix on your paper. As I mentioned before you need water to watercolor. So it is neccessary to have a water container at your working place. 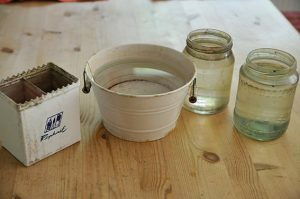 You need the water to moisten your paints but you also need the water to clean your brushes. You can use for a water container what ever you want to use, if it is one made of plastic or a glass bowl and so on. You don’t need to buy any extra water container at an art store. Don’t use a too small one, the larger it is the longer the water keeps clean. If the water is dirty then get new clean water. Often artists use two water containers, one for cleaning the brush and the other one to use it for the paints. 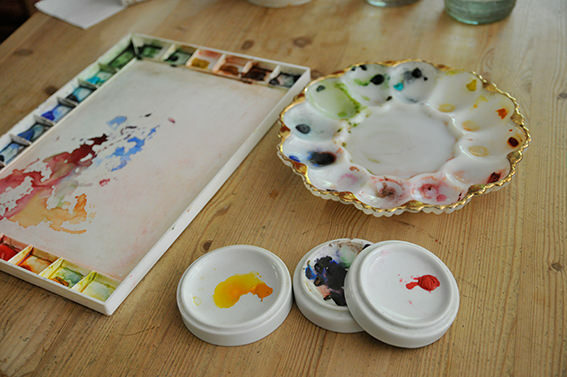 Watercolor palettes are made of plastic or porcellain. Plastic palettes are lighter in weight but with time the mixing area will become stained. Porcellain palettes are very easy to clean but heavier in weight. It is needed to use a palette on which you can separate your paints and it is also needed to have a separate mixing area, otherwise the watery paint would flow into each other. 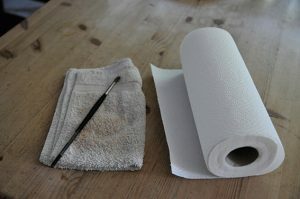 Once you have finished your painting session you can clean the mixing area with water and a towel. I also have always Towels in use. I use the towels to remove water from the brush. Also with paper towels you can remove some water or wet paint from your painting surface. You also can use it for fixing mistakes. I also often put a few paper towels on those areas of my painting on which I am not working. This helps me to keep this area clean when I put maybe my arm there while painting. It helps especially when your cat comes in with dirty paws and wants to help you with your painting!!! Towels are a Must-Have-Tool. A pencil in 2 B or a pencil F works very good for your drawing on watercolor paper. Use a soft eraser to remove or to lighten your pencil lines. An electric eraser is very useful for getting back some of your highlights. A toothbrush works very well to remove some paint. The same does a sponge. There are special watercolor sponges available. It seems to be a very long list of Watercolor Tools for Beginners and you only wanted to start to paint. You don’t need to buy all colours at once or all the brushes. Usually you have paper towels at home and a cup of water will work very well as water container. 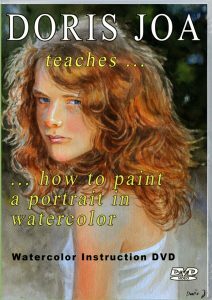 If you want to start with some free demonstrations then have a look in my Free Watercolor Lessons Section. If you want to learn more then have a look at available DVDs and online videos. For inspiration check out my free Reference images.